Villa Beach Daze, Spectacular View of Oyster Pond Marina from the Pool Deck ! Welcome to Beach Daze! **AS OF OCTOBER 2014 - NEW OWNERS** **NEW Paint, Light Fixtures. TV's, Outdoor Furniture, Bedding and Kitchen Appliances** This tropically decorated three bedroom, three and a half bath villa in Dawn Beach Estates (a gated community with 24/7 Security) was designed with stunning views of the Atlantic Ocean from every room. Two of the bedrooms have king-size beds, and the third has a queen bed. All bedrooms have ceiling fans as well as air conditioning units and in-suite bathrooms. The master bedroom has a flat-screen TV with cable and a DVD/VCR. It opens directly onto the pool deck, and the safe is located in this room. This beautiful villa has a private pool that features a sitting ledge. The pool deck has a covered bar area for your own private happy hour. The kitchen is fully equipped with all major appliances. The laundry area is located just off the kitchen for your convenience. There is dining both inside and outside to accommodate six people. A gas BBQ grill is located outside the kitchen. The living room area has cable TV, stereo with DVD/CD player, wireless internet connection. This is a non-smoking villa. Beach Daze is perfectly situated on the Dutch side. The Dutch side of the island offers you great casinos and fantastic night life while the French side has wonderful dining for your pleasure. It is a short walk to Dawn Beach. Initial provisions are included for your convenience, and our Beach Daze concierge is available 24/7 to make your vacation stay at our villa as memorable as possible. One Island but you get to visit Two Countries - Dutch and French!! Stayed here for a week in February, we were scheduled for two weeks but moved after the first, we did receive a partial refund for the second week. The house is in need of renovations, I read somewhere that the house was built in 2010 but it is much older than that, perhaps built in 2000. Many things outside of the house need to be replaced, the grill is gross and I would never use it. The outside bar hasn't been touched in years and is unusable. The couch in the living room has mildew and/or mold and needs to be replaced. We also had major problems with cockroaches, they sprayed for them but every morning would find 2 to 3 dead ones on the floor, not something to wake up to. The outside shutters rattle when it is windy so at night you get the pleasant sound of metal banging against the house. To top off the week the house next door is having major reconstruction done so at 7:15 every morning you get to wake up to hammering, sawing, and on occasion a jackhammer,this is not the fault of the owner but who wants to have construction noise and workers 20 feet away when you are trying to lay outside. On the good side the house is clean and we found the beds comfortable. Unlike the first review we felt the house is safe, we just made sure that everything is locked up. Kitchen is nice with good appliances, bathrooms are clean and up to date. The pool is also much smaller than we expected, it is not heated and was a little cold to use so we just were ale to stick our feet in it. I rented from the subject property for Christmas week with my family of 5. I have three daughters ages 9-15. 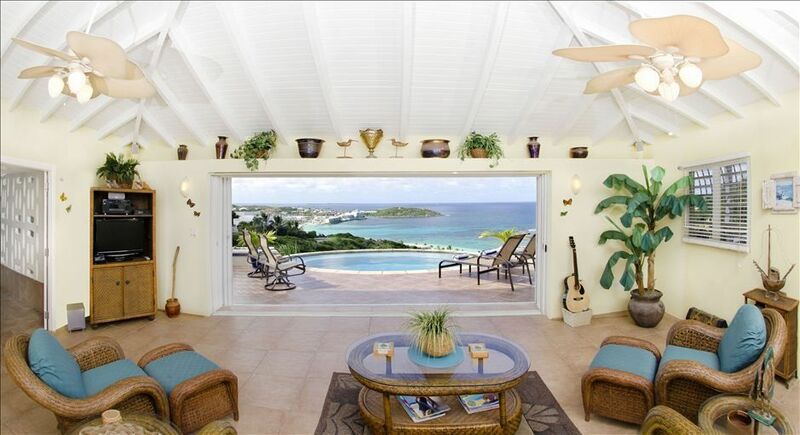 My family was very excited about the house with its pool off the veranda and its sweeping views of the Carribean. The kitchen was clean and the property was in excellent condition. The house has secutity measures including storm shutters. Please ensure that when you go to sleep or leave the house for any reason, all storm shutters are fully engaged. We locked the doors the second night while at dinner, and did not engage the storm shutters. Unfortunately, that evening, a burglary occurred at the house. My iphone and 2 ipads were stolen from the house. It is too bad as the house is beautiful, well maintained with terrific views. The only way to secure the house is to engage all security shutters fully down and sleep that way as well. Stayed at Beach Daze with another couple in November, 2010. The villa was gorgeous, well equpped, immaculate and one of the best views I've ever seen. Never bothered to write a review until I saw the one describing the property as "dangerous". I have been to St Martin 12 or 13 times and one of the things I've noticed over the years is that the type of thefts described in the last review are becoming more common everywhere on the island. This property is as vulnerable as everything else on the island. However, with the utilization of the precautions recommended by all property owners(every door and window locked when leaving the villa) this property is worth the effort. Since I typically stay on the french side, I found the effort to get to the french side a bit more difficult, but if you like Dawn Beach and the Oyster Pond area, this place is worth it and as safe as anywhere else on the island. It is in a gated community but that does not mean it is isolated from the rest of the island. Don't be scared off by one incident, as unfortunate as it was for the last reviewer. Ittruly is a wonderful villa and you will be rewarded when you return home in the evening or when you get up and sit on the veranda for breakfast with one of the most beautiful and relaxing views you could ask for.